There's not a Little Caesars® restaurant in my area. Can I still run a fundraiser? How long does it take to run a fundraiser? Are there any up front costs to my group? How are my Pizza Kits delivered? Do you have a local representative in my area? Once the Kits are delivered, how long can they stay out of refrigeration? What types of groups are able to run the fundraiser? What types of Pizza Kits are available? We're watching what we eat. Are Pizza Kits good for my family? How is the quality of a Pizza Kit? How long may I keep unopened Kits in my refrigerator? Can I buy Pizza Kits outside of a fundraiser? I have food allergy concerns. How do I find out what's in your products? I'm a vegetarian. Does your pizza sauce contain any beef or beek by-products? Do you need a pizza stone to bake a Pizza Kit? I've opened by Kit and can't locate the baking instructions. What should I do? May I eat raw or unbaked cookie dough? Q: There’s not a Little Caesars® restaurant in my area. Can I still have a fundraiser? A: Absolutely! Every fundraiser is registered through our Customer Care Center, so it’s available to nonprofit organizations throughout Ontario, Alberta and Saskatchewan, Canada, and in the continental United States. To get started, Register Online or call us at 1-888-4-LC-KITS Monday - Friday from 8:30am – 8:00pm ET. Q: How much profit does my organization earn? A: The profit you earn depends on your group – how you promote your fundraiser, how motivated your sellers are, and how often your group runs fundraisers. You will earn $6 for every item sold! Our fundraising experts will share proven tips and techniques to help you run a successful fundraiser. Q: How long does it take to run a fundraiser? A: From your first contact with us through the delivery of your Kits, you can run a Little Caesars® fundraiser in approximately 4-6 weeks. Once you schedule a delivery date and time, you’ll receive your FREE order forms and sales materials, or you can download them from our website, and begin selling. We recommend selling for 2-3 weeks. Your customers will also be able to order online and pay by credit card. At the end of your fundraiser, you’ll submit your order and we’ll deliver the Kits on your scheduled delivery date and time. Q: Are there any the up front costs to my group? A: There are no up front costs with a Little Caesars® Pizza Kit fundraiser. Your sellers collect payment as they sell, or customers may order online and pay by credit card. Order forms and payment are collected and tallied by your group leader/Chairperson, usually about 7-10 days prior to the delivery of your group’s order. On delivery day, your group will pay our driver for the product cost you’ve been invoiced -- your profit is already in the bank! ONTARIO - Delivery is FREE with a minimum order of 200 items. If a group sells 100-149 items, we will guarantee delivery with a $75 under the minimum charge. If a group sells 150-199 items, we will guarantee delivery with a $50 under the minimum charge. We are not able to deliver orders under 100 items. Additional freight charges and delivery restrictions apply in outlying areas. .
ALBERTA & SASKATCHEWAN - A minimum order of 100 items is required for delivery. Freight charges apply to all deliveries. Delivery is not available in all areas. Should an Alberta group sell under the minimum order of 100 items, but sell at least 50 items, Little Caesars® Pizza Kit Fundraising Program will provide delivery service with an added freight charge. Unfortunately, we are not able to deliver orders under 50 items. Any combination of Pizza Kits, Cookie Dough or speciality items qualify as an item and apply toward the minimum. Bonus items can not be applied toward the minimum. Your Customer Care Representative will cover all of these details with you prior to scheduling your fundraiser. However, please feel free to Contact Us for more details at 1-888-452-5487. Q: How are my Pizza Kits delivered? A: Your pizza crusts and cookie dough are baked fresh daily in our own bakery and delivered to your organization in a refrigerated truck from one of our distribution centres located in Ontario and Alberta, Canada. Q: Do you have a local representative in my area? A: Little Caesars® Pizza Kit Fundraising Program is easy to run. Just call our toll-free number 1-888-4-LC-KITS (1-888-452-5487) and one of our fundraising experts can quickly answer all of your questions and help get you started. We will provide everything you need to ensure a successful fundraiser. Q: Once the kits are delivered, how long can they stay out of refrigeration? A: Pizza Kits are fresh products – which is what makes them so delicious – and they are delivered to you frozen. As a perishable product, they can be out of refrigeration for 4-6 hours. Pizza Kits can even thaw and be re-frozen. Pizza Kits should be distributed in a cool place, away from direct sunlight or heat. Every item is clearly marked with handling instructions on the outside of the box, and detailed instruction inside. Q: What types of groups are able to run the fundraiser? A: Any nonprofit organization throughout Ontario, Alberta, Saskatchewan Canada and in the the continental United States can benefit from the Little Caesars® Pizza Kit Fundraising Program. Since 1997, schools, daycares and preschools, sports teams, youth clubs, church groups, and civic organizations have raised millions of dollars selling pizza kits, cookie dough, and more! A: It’s easy! Register Online or call our Customer Care Center at 1-888-452-5487 Monday - Friday from 8:30am – 8:00pm ET and a friendly representative will answer your questions and help schedule your fundraiser. Q: What is a Pizza Kit? A: Little Caesars® Pizza Kits include everything you need to make delicious pizzas, specialty breads, and cookie dough at home in less than 10 minutes. All items are individually packaged, so whatever is not immediately used can be stored in your fridge or freezer. Q: What types of Pizza Kits are available? A: You’ll find Kits for making all of your favorites, including our Pepperoni Pizza Kit, our world-famous Crazy Bread and mouth-watering Italian Cheese Bread. All of our Kits are exclusive to our fundraising program. You'll also want to try a gourmet treat just for you by The Cookie Kitchen! With several great tasting varieties to choose from, everyone in your family will have a favorite of their own! Q: Are Pizza Kits expensive? A: No! Little Caesars® Pizza Kits are a tremendous value. Pizza Kits have everything you need to make 3 family-sized pizzas. Variety and specialty Kits include enough for the entire family. Little Caesars® is known for quality and value, and you’ll find that Pizza Kits deliver with superior taste and affordability. You’ll be thrilled with our delicious and convenient products! You get your money’s worth with Little Caesars Pizza Kits! Q: We’re watching what we eat. Are Pizza Kits good for my family? A: Everything in your Kit is carefully selected on the basis of quality, taste and nutritional value. You’ll find good-for-you ingredients like 100% real cheese, bone-building calcium and essential vitamins and minerals. Plus, you can easily “customize” your pizza by adding your family’s favorite vegetables or lean meats. Q: How is the quality of a Pizza Kit? A: Purchase your Little Caesars® Pizza Kit with confidence! Your expectations will be exceeded by our delicious patented crust, custom 100% real Mozzarella and Muenster cheese blend, our unique sauce made with vine-ripened tomatoes, specially- crafted spice blends, and high quality toppings. There’s nothing else like it! 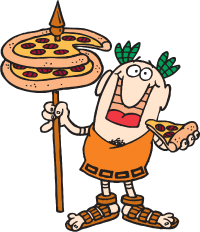 Enjoy the best in fundraising taste, quality and value with Little Caesar® Pizza Kits. Q: How long can I keep unopened kits in my refrigerator? A: Pizza Kits must be stored in either the refrigerator or freezer. Pizza Kits can be refrigerated up to 7 days, or can be stored in the freezer for up to 95 days…but in most families they’re gone long before then! Other Kits and specialty items may require special handling, so be sure to check the specific handling instructions on each Kit. Q: Can I buy Pizza Kits outside of a fundraiser? A: Little Caesars® Pizza Kits are available exclusively through fundraisers. Q: I have food allergy concerns. How do I find out what’s in your products? A: Click here for product information, including allergens for all of our products. Should you have any additional questions, call us at 1-888-452-5487 Monday - Friday from 8:30 a.m. – 8:00 p.m. ET. Q: I’m a vegetarian. Does your pizza sauce contain any beef or beef by-products? A: No, there’s no beef or beef by-products in our pizza sauce. Check out our products for specific ingredient details. Plus, remember our Kits are “customizable” – it’s fun adding your family’s favourite toppings and creating your own masterpiece! Q: Do you need a pizza stone to bake a Pizza Kit? A: There’s no need to dig out that pizza stone. You bake your Pizza Kit directly on the oven rack. The heat from the oven bakes the pizza evenly on each side – and it takes less time! Q: I’ve opened my Kit and can’t locate the baking instructions. What should I do? A: Oops! Baking Instructions for all of our products are available online. You’ll be enjoying your freshly prepared Little Caesars® Pizza Kit in no time at all! Q: May I eat raw or unbaked cookie dough? A: Cookie dough should always be baked before consuming. We do not recommend eating raw or unbaked cookie dough.